Dave Whitson is originally from Dardenell, Arkansas, and graduated as a Paramedic from the University of Arkansas, Ft. Smith in 1994. 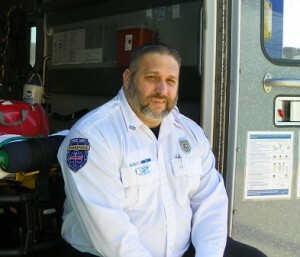 Dave worked in Arkansas as a Paramedic before moving to Oklahoma and finding his home at Muskogee County EMS 20 years ago. In addition to his duties as a Paramedic, Dave is a Critical Care Paramedic, Field Training Officer, Advanced EMT Instructor, Emergency Service Fire Instructor, Swiftwater Rescue Technician, and the Strike Team Leader for MCEMS Strike Team B. Dave recently retired as the Fire Chief of the Warner Volunteer Fire Department after receiving many EMS and Fire Service commendations, including an Oklahoma State citation for the wild fires of 2012. He also honorably served his country during a tour of duty with the US Navy Reserve as a Navy Corpsman. Being involved in a profession that helps individuals in their greatest hour of need is a perfect fit for Dave. In December 2014, Dave was awarded one of Muskogee County EMS’s highest honors, the MCEMS Valor Award, due to his bravery in resolving a potentially deadly situation. A friend, who was also a former medic, experienced an acute psychiatric event, became suicidal, and was barricaded in his home with multiple firearms. The law enforcement SWAT team had responded and set up a communication system but were not making progress. Knowing the history of this gentleman and knowing him as a former medic and peer, Dave offered to go into the home and talk to him. Without hesitating, Dave put on a bulletproof vest, went in, and was able to successfully convince the former medic to surrender his weapons and be transported to the hospital. Due to Dave’s bravery, empathy, and concern, a hurting individual was able to receive the help he so desperately needed. Because of Dave’s outstanding professionalism and his exemplary performance, Muskogee County EMS is proud to nominate David Whitson for the American Ambulance Association 2016 Star of Life Award.